Observing OSHA guidelines for hazardous locations through the application of explosion proof equipment should never be overlooked. Operators at the Verla International cosmetics factory learned this the hard way, when the plant was engulfed by fire stemming from two crippling explosions. The private building hosts 225 workers, of which 20 were killed and 125 injured during the blast. Inspectors from OSHA and the New York Fire Department, as well as the State Division of Building Standards and Codes are in the process of completing a six-month investigation at the site. The cause of the explosions is currently unknown. Hazardous location specialists were deployed at the 52,000-square-foot plant to contain the catastrophe and provide insights about the flammable materials used by the business. A report from ABC News revealed one of the violations involved combustible liquids. Moreover, federal inspectors highlighted the fire is being assessed as a chemical explosion. The cosmetics factory manufactures fragrance products, cream and nail polish. Although it is too early to conclude that such materials caused the explosion, the materials can act as very aggressive catalysts during fires. Without proper protection, small fires or sparks could easily lead to an explosive chain reaction, when interacting with volatile substances in the hazardous location. Generally speaking, a wide range of fragrance products contain ethyl alcohol (also known as ethanol) – a very flammable substance. Furthermore, vapors from such materials are sensitive to combustions. These substances are so volatile that the US Postal Service heavily regulates the shipment of perfumes and fragrance products, ensuring a limit of 16 fluid ounces. The types of chemicals and materials used at the Verla International factory suggest Class I, Division 1 and 2 explosion proof equipment are suitable for safe operation inside the plant. Specifically, Class I, Group C and/or D are sufficient for preventing ignitions related to ethanol and ethylene. The groups also include acetone, ammonia and other flammable acids commonly used in manufacturing cosmetics. 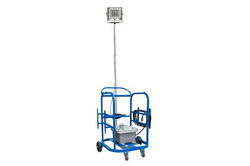 For more information about explosion proof lights and equipment, please visit the Larson Electronics website.